An 11-year veteran in the NFL, Gay has been through a lot to get to the highest stage in the sports world but losing his mother was by far the toughest. His story has led him to countless speaking events, including the Men for Change Luncheon in Fort Collins at the newly-named Canvas Stadium. More than 100 people, primarily men, came to the function to hear Gay's story. William Gay has a powerful message to share. An 11-year veteran in the NFL, Gay has been through a lot to get to the highest stage in the sports world but losing his mother was by far the toughest. His story has led him to countless speaking events, including the Men for Change Luncheon in Fort Collins at the newly-named Canvas Stadium. More than 100 people, primarily men, came to the function to hear Gay’s story. Born and raised in Tallahassee, Florida, Gay and his two brothers were raised by a stern but loving Carolyn Hall Bryant. After things fell apart with Gay’s father, she married Vernon Bryant, the father of Gay’s younger brother. The relationship was rocky but outside of a couple of aunts and uncles, Gay and his brothers never knew there were issues in the marriage. 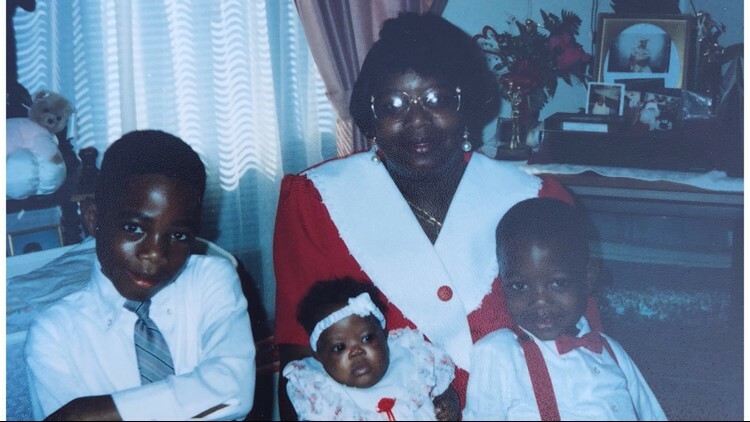 William with his mom, Carolyn, and his younger brother and cousin. On March 14, 1992, Carolyn decided she had had enough. “She was fed up with him and she was ready to move on with her live. She was ready to change her life,” Gay said. Carolyn had a great job working for the state of Florida. She was going back to church. Life was looking up for the Bryant household once Vernon was out of the picture. That Saturday, Carolyn had dropped off her sons at her mother’s house before heading to one of her friends’ apartments. Instead, Vernon went and found Carolyn. He shot her three times before shooting himself. He died on the scene but Carolyn survived for five more hours before succumbing to her injuries. Gay, who was seven at the time, waited at the hospital but never got to say goodbye. The boys’ grandmother, Corine Hall, took them in as her own. Because they were so young, Gay and his brothers were left in the dark about the sudden passing of their parents. For the next four years, Gay would struggle in school and life and Corine struggled to reason with him. It wasn’t until an uncle stepped in and sat Gay down for a hard conversation about the path he was taking. Football was his “safe haven”, the place where he could be free from the world’s problems. So from that moment on, Gay straightened up. He made good grades, obeyed his grandmother, and excelled in football. A three-star prospect out of Rickards High School, Gay landed a D1 scholarship at Louisville. Four years after that, he was a fifth-round selection for the Pittsburgh Steelers in the 2007 NFL Draft. A year later, Gay became a Super Bowl Champion. Through all of his football success, he still didn’t know the details surrounding his mother’s death. So on a trip back home to Tallahassee in 2014, Gay begged his uncle to tell him the truth – his mother was a victim of domestic violence, shot and killed by their step-father. To this day, Gay believes that his step-father was “looking for all of us” on that fateful day. Armed with the truth, Gay returned to Pittsburgh for the 2014 season. The Steelers were set to host the Colts on October 26 at Heinz Field. With the thought of his mother weighing heavily on his mind, he decided to break the NFL’s uniform policy by wearing purple cleats – the color representing the movement to end domestic violence. Gay knew there would be a fine to pay, but he did it anyway and ended up playing one of his best games of the season. He made a season-record eight tackles, six of them solo. He intercepted a pass from Andrew Luck, returning it for his very first pick-6 of his career as the Steelers went on to win, 51-34. His performance drew the media’s attention as did his colorful footwear. With his story out there, the world took notice. At first, Gay saw sharing a painful part of his past as therapeutic. Over time, more people reached out to him, sharing their own stories of domestic violence. Some even said he helped them leave an abusive partner. Four years later, Gay is still sharing her story, creating awareness, and saving lives, even if he doesn’t see it. Gay signed a one-year contract with the New York Giants in April 2018. He continues to lead the fight to create awareness for domestic violence by volunteering at shelters and other organizations. If you or someone you know and love is caught in an abusive relationship, please call 911 or the National Domestic Violence Hotline at (800)799-SAFE(7233).